When we started this endeavor of the steamboats on Findley Lake we thought this should be easy. 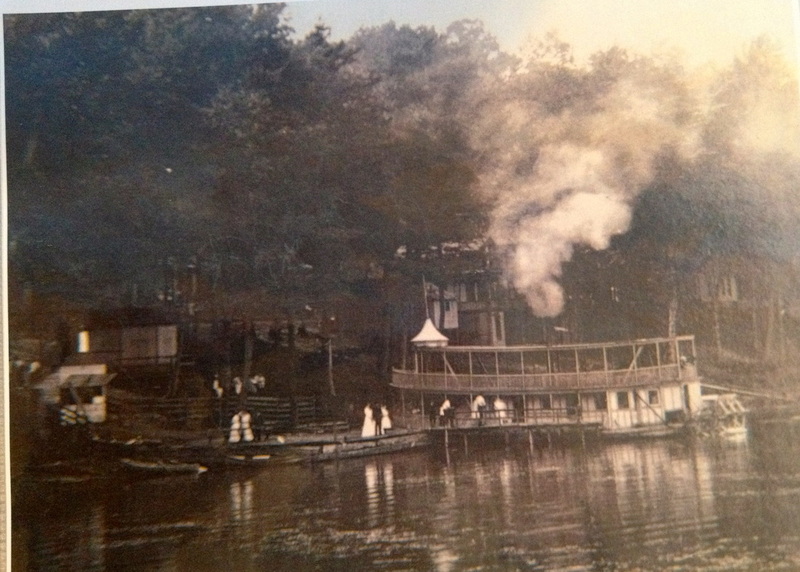 We thought there could only be 2-3 steamboats on the lake back at the turn of the century. Were we ever wrong! Not only were there several steamboats but even an electric boat. They have been in some cases difficult to name due to lack of clear information, or some boats may have undergone some major renovations during their life that changed there appearance and names. 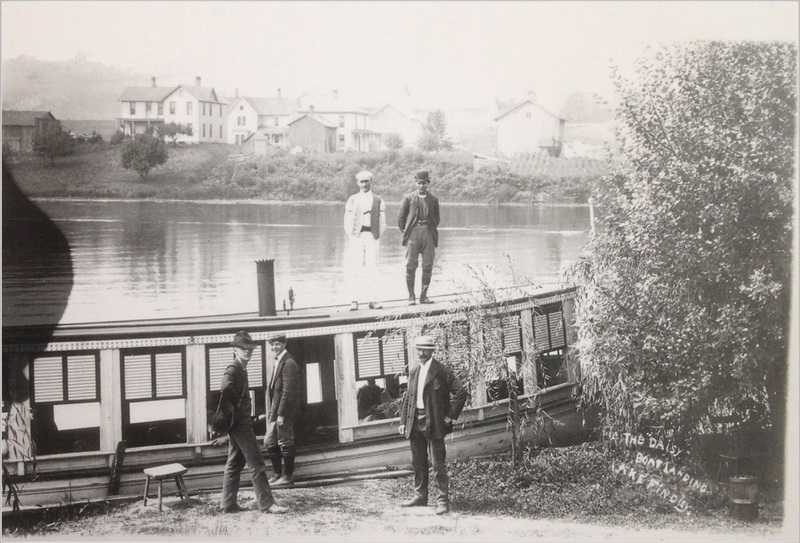 Our information is not an attempt to be complete but the highlights of some of the research John Swartz has completed about steamboats on Findley Lake which you can find at the historical society in the Community Center on North Road. 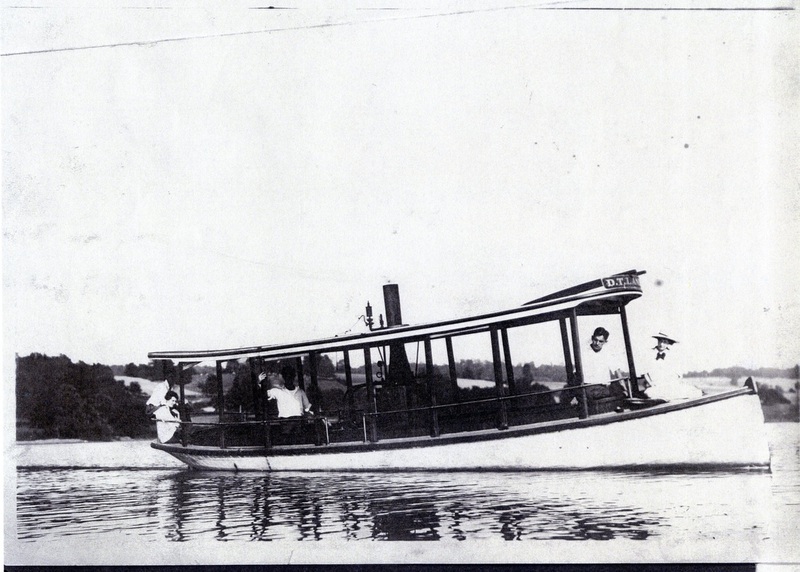 The Eauclaire ,pictured below, was purchased from William Breckenridge by L.F. Swartz and improvements made and turned into the first Silver Spray a single Decker rear paddle wheeler. This must of been quite an undertaking since the Euclaire was a mid ship paddle wheeler they called a side wheeler. A name change was then in order to the Silver Spray. The second Silver Spray was a ( double decked), stern wheeler steamboat. It was an entirely new and different boat? Building a boat of this size would be a tremendous undertaking. The 4 pictures are of the (double decked) Silver Spray. One thing is clear it sure is a beautiful paddle wheeler and must of been an awe-inspiring site on Findley Lake on any summer afternoon. Louis and Philip Swartz at the helm of the Eauclaire before transformation into the first Silver Spray. 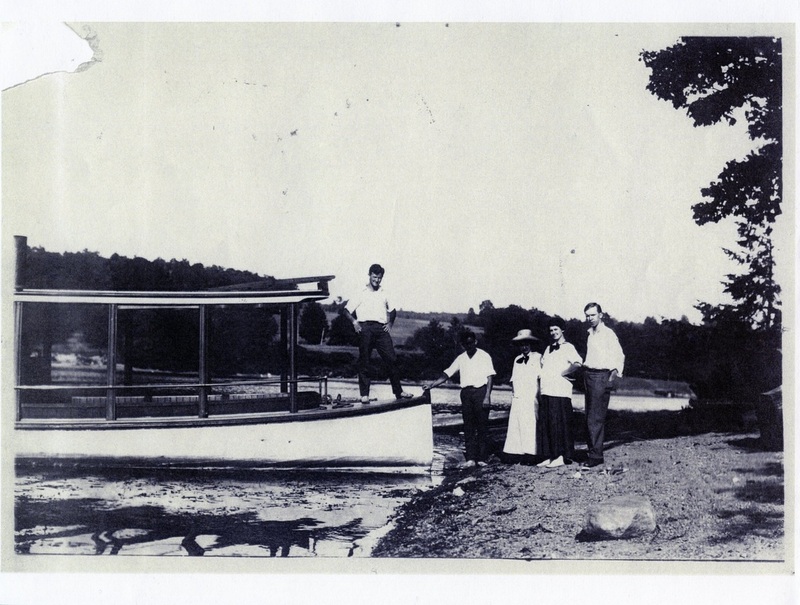 The finshed boat is pictured in John Swartz's research and booklet. 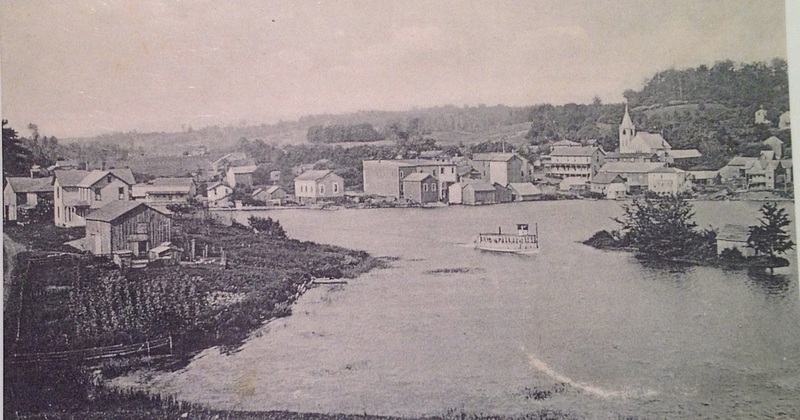 We are sure the above steamboat on the left is the Eauclaire because you can read the name on the bow. The boat appears to be unloading are at the Lake Side Assembly Grounds. The boat is at the Lake Side Assembly . L.W.Swartz is standing by the helm so we think he has already purchased the boat from Mr. Breckenridge. Later on the boat is transformed into the Single decked stern paddle wheeler The Silver Spray. The second Silver Spray a ( double decker), stern wheeler steamboat. Many boat owners put the roman numeral 11 behind the name but apparently not in the case. Building a boat of this size would be a tremendous undertaking. The 4 pictures are of the (double decker) Silver Spray. 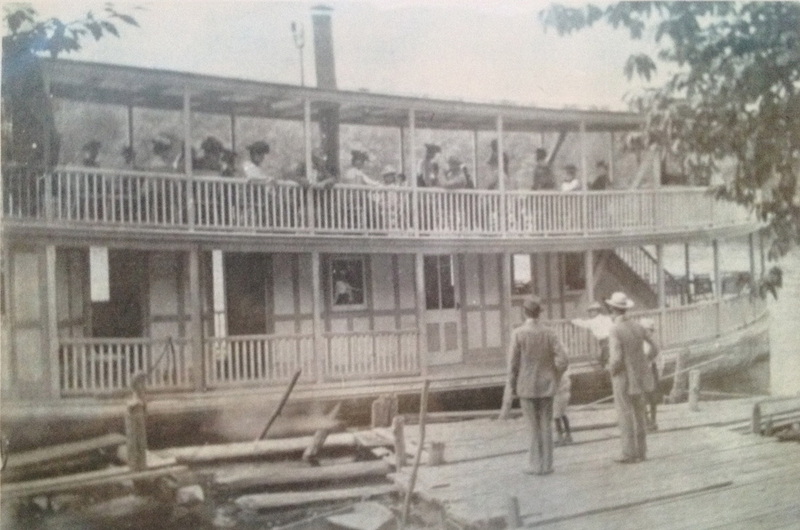 There was only one double decker steamboat on Findley Lake. It was the Silver Spray owned by the Swartz brothers which is the boat in the above pictures. The Silver Spray was a grand boat with the helm covered with a curved Victorian like roof over the helm. Its power came from a high pressure steam engine to a paddle wheel on the back; not a prop driven boat. 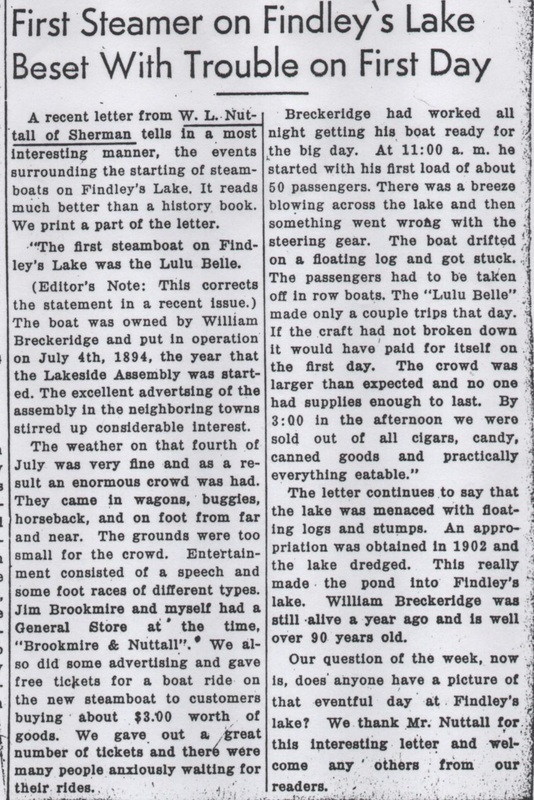 It was the largest boat on Findley Lake. Today steam powered paddle wheel boats are quite rare and their information is not plentiful. The Chautauqua Bell is one of only a few in fresh water still working a small lake and definitely worth a tour. She is quite a lady. There is an Antique Boat Museum in Clayton , New York north of Watertown on the St Lawrence River. There is no equal in the United States to this museum. They display the largest collection of antique and classic boats in North America. They have many events throughout the year and it is about a 5 hr drive from Findley Lake. There is also a steam boat club with smaller restored boats that have visited the boat museum in the past. 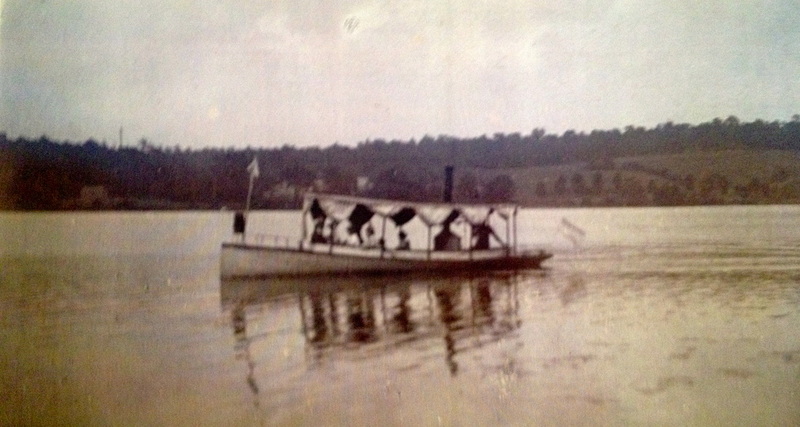 There are only a few steamboats left similar to what sailed on Findley Lake. What a great family trip that would make. 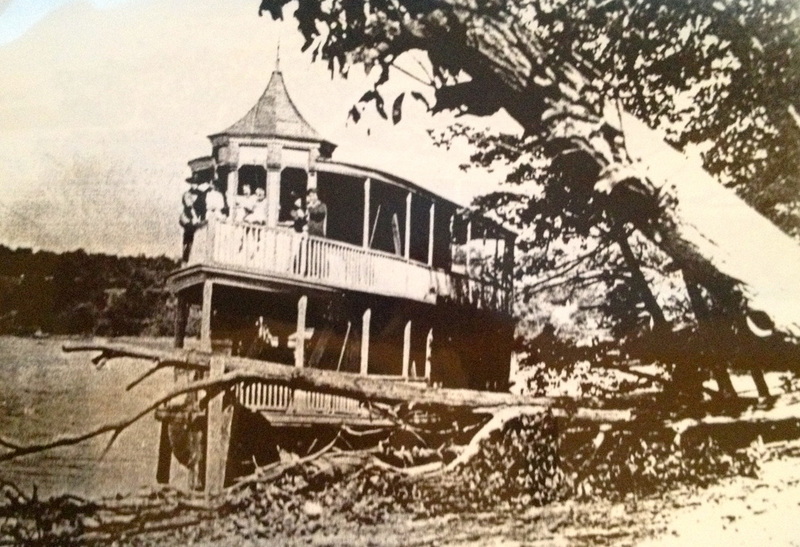 We also have our own boat museum the" Lawson Center" on Chautauqua Lake in the process of restoration at Bemis Point . The Daisy was a fine looking boat with "sun screens" in the windows. Will Shum owner of the boat is standing to the side of the walk with a white hat waiting for passengers. Christopher Shum the builder is not in the picture. Let us know who the fellow on top of the boat is that looks dapper dressed in white. The Daisy is our heading photo on the website and many other pages. This little boat is one of our favorites It has a "fan tail" like the D.T. Lane and is very pleasing to the eye. We believe it would be classified as a steam powered launch. 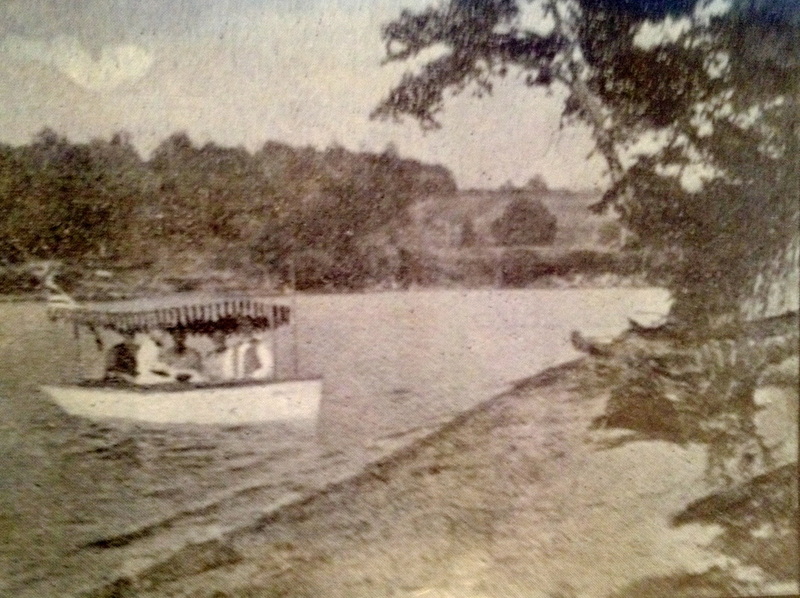 The photo was taken at the Shum house , at the north end of the lake, which is no longer in existence. It would be located where Larry Bock now lives on Sunnyside Rd or Rt 426. See newspaper clipping on missing anchor on our website. The D.T. Lane above was owned by the handsome D.T. Lane from Franklin Pa . His cottage still stands at the entrance to the lagoon . There is more complete information on the website under historical events. We do not know the name of this boat. It is a fan tail but the boiler "appears" to set farther back in the boat than either the D.T. Lane or the Daisy. This boat we have no name for at this time. Was it the D.T. Lane or Daisy before makeover? Check out the flag pole in front then look at the Daisy. We have this boat listed as an electric boat. We see no name on it and no smoke stack. The boat is quite large to be rowed so we believe this is accurate. These would be very rare today. If anyone has more information we would be glad to hear from you. This is our mystery steamboat. 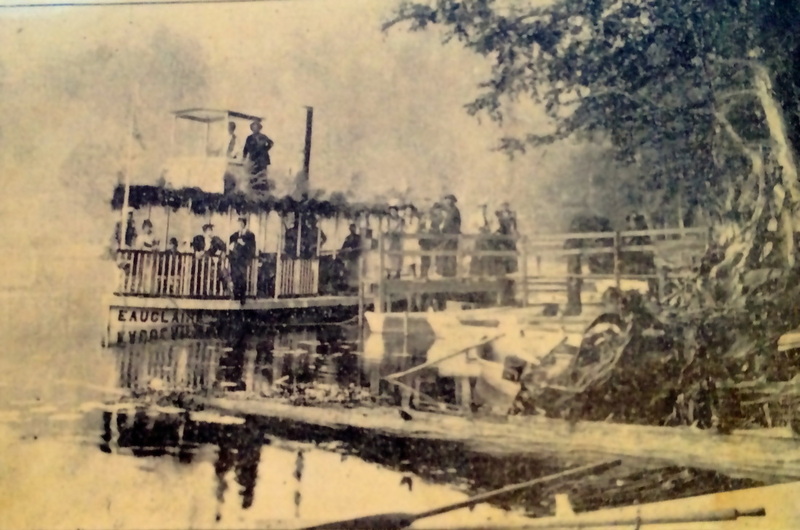 The photo is taken from the back of a 1896 Lakeside Assembly Program of a "mid-ship paddle wheel steamboat". This maybe the Euclaire before any transformation. This is so interesting we had to include the full newspaper account from 1949. After reading this account it brought up another interesting fact that we know nothing about; the dredging of the lake in 1902. We knew that it had to be dredged sometime because the "narrows" of the lake is some of the deepest water. It should be the shallowest we believe because this is probably where the two ponds were connected by a small stream. Did they actually dredge or use horses and slip scrapers? How much did they dredge ? Where did they put the dirt? If anyone has any information about this we would be grateful to hear from you. Benjamin Franklin said the are three types of people. Those that are immovable, those that are movable and those that move. History shows that the Nuttall Family were movers. William Laverne Nuttall was one of those that move. In trying to find clues to the dredging of Findley Lake we find this account from W.L. Nuttall’s 1869-1954 Reminisces presented to the historical society by his daughter as “written from her notes of his dictation in 1952”. The short introduction to the 30+ page manuscript should give a clue. This person was a businessman in every sense of the word. If you are interested in the early history of our area or you want to see into the progression of a successful business person from a young boy and how the lake was dredged this is a must read. Good business people are truly problem solvers. If they have the skills they are very successful and W.L. Nuttall was successful.